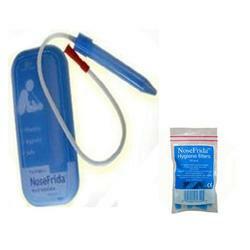 Nosefrida is a doctor recommended nasal aspirator that removes mucus from your childs nose. It was invented in Sweden by Ear, Nose and Throat Specialists, and has been used by Swedish Moms and Dads for years. This Kit include Nosefrida Hygiene Filters (20 pcs). Clinical studies have proven that the hygiene filter prevents mucus and bacterial transfer from child to user. NoseFrida is safe to use on newborns and preemies. There is no risk of sucking too hard. NoseFrida is made of non-allergenic, latex-free, BPA-free, and phthalate-free polypropylene. It is manufactured in environmentally-conscious Sweden. Nosefrida is a doctor recommended nasal aspirator that removes mucus from your child's nose. It was invented in Sweden by Ear, Nose and Throat Specialists, and has been used by Swedish Moms and Dads for years. This Kit include Nosefrida Hygiene Filters (20 pcs). Nosefrida is effective and hygienic and has been clinically tested. It is safe to use and causes no injury to you or your child. No more runny noses!